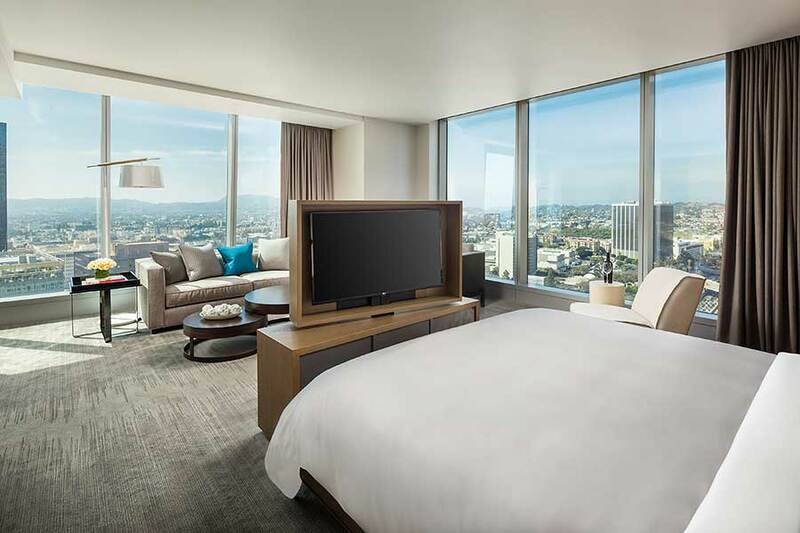 W Hotels Worldwide announced the opening of W Bellevue, marking a new era of design for W Hotels in North America that celebrates the local as never before. 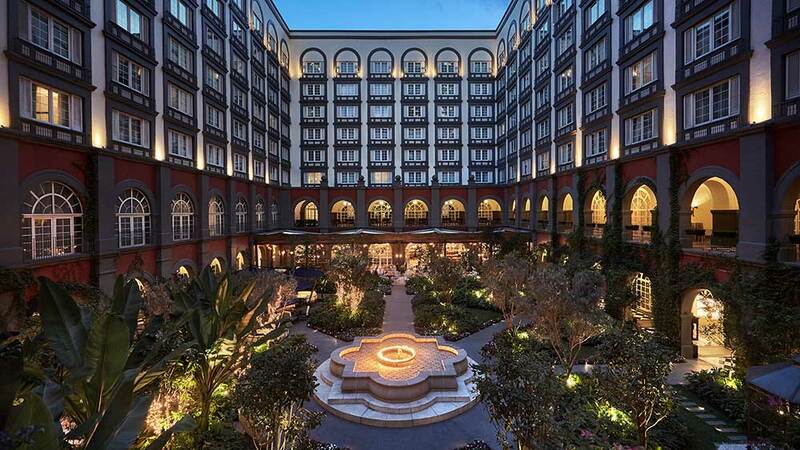 Playing off Bellevue’s tech-forward neighbors and centuries-old traditions, the design of the hotel embraces the region’s juxtaposed affinity for both its natural surroundings and groundbreaking innovation. 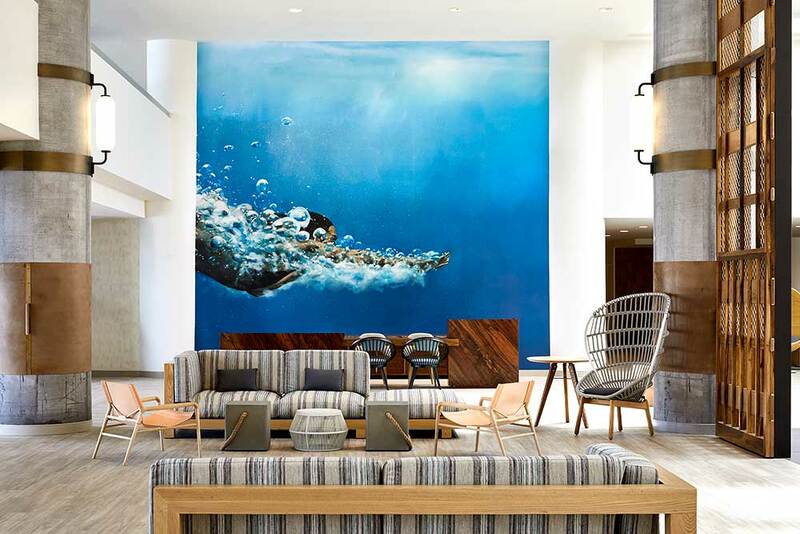 The hotel pays homage to lakeside culture with cabin-like architecture, thoughtfully reimagined traditional décor, and locally-inspired cocktails and cuisine. Built as a W from the ground up, W Bellevue offers a modern yet invitingly familiar setting to welcome locals and travelers alike to 220 guest rooms and 25 suites in the newest Lincoln Square expansion. Neighbor to some of the world’s most well-known technology companies such as Microsoft and Amazon, Bellevue has become best known as the Pacific Northwest’s tech playground. Locally known as the ‘Eastside,’ Bellevue is a magnet for the rugged individualist who is attracted to natural beauty and flourishing professional opportunities. 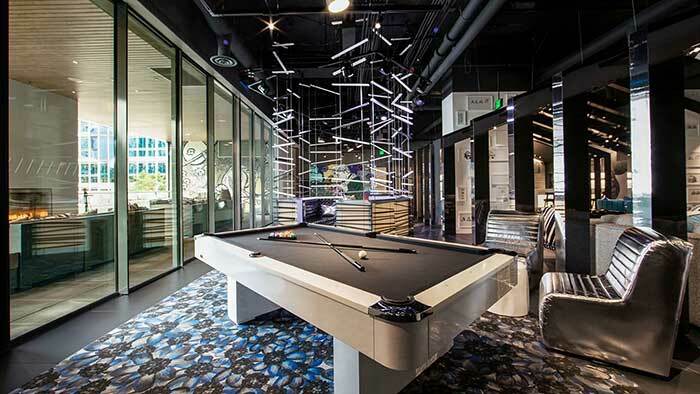 W Bellevue boldly reinterprets the city’s historic lake-centric culture, blending with its newfound reputation for innovation to create a modern and playfully designed space for any adventurer. And, in true W fashion, whether guests crave a cold craft cocktail or need Insider access to the latest happenings in town, the team at W Bellevue will make it happen with the brand’s signature Whatever/Whenever service. Designed by HKS Inc. lead by Mary Alice Palmer and HKS architect Tom Sprinkle, W Bellevue transports guests to a modern lodge oasis, inspired by the region’s iconic setting beside Lake Washington. 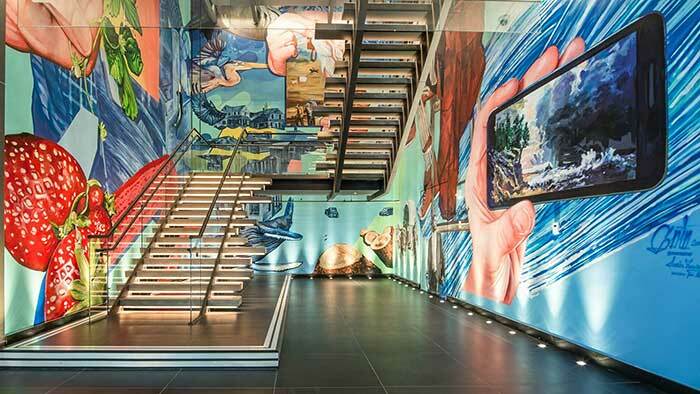 Upon entering, guests are immediately greeted by a striking, reclaimed wood staircase surrounded by rich, colorful street art from famed international artist Gaia. 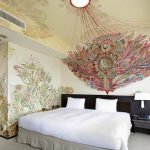 Additional original artwork from renowned artists Lady Aiko and Zio Ziegler make unexpected appearances throughout the property. 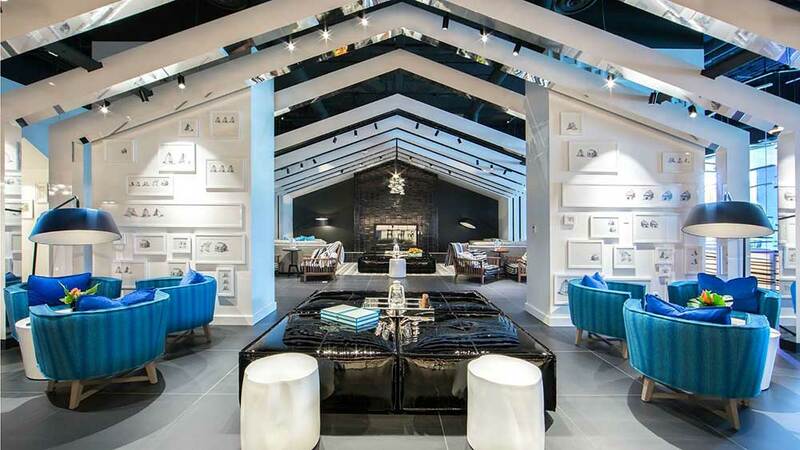 The hotel’s Living Room (the brand’s take on the hotel lobby) is a clubhouse for the modern traveler, showcasing exposed A-frame beams that line the ceiling – reminiscent of a log cabin home. Mirrors contour the interior edges of the room, creating the illusion of open ceilings that connect seamlessly with the open-air porch area and adding a modern feel so guests can always be on view. Deep sofas and lounge chairs, modeled after ’70s vintage furniture that one would find in a lake house, are mixed with rustic plaid throws and plush pillows creating texture and warmth in the room. Just steps off the Living Room, The Porch provides an open-air, pop homage to the lake house where guests can mix and mingle with a house-made cocktail in hand or relax on a porch swing by the roaring fire. The Library is a pulp-pleasure paradise for those looking for a bit of wit with their drinks. Living up to its name, guests can cozy up with one of the racy romance novels that fill the shelves or help themselves to vintage board games. Each of the 220 guest rooms and 25 suites at W Bellevue bring guests closer to the communal history of the city, dating back to the first settlers who gathered around the docks and ferries and served as the center of community and commerce. Rooms feature design elements like side-table lights which mimic traditional dock lamps and inflatable tufted headboards, a nod to historic dockside décor. Beds are adorned with painted pillowcases featuring pulp poetry reminiscent of the summer escapist novel while ‘wine spilt’ carpets reflect the burgeoning wineries of the region. Glass showers, placed in the middle of each room, personify the boundless nature of the hotel’s design. The 2,300-square-foot, two-bedroom Extreme WOW Suite (the brand’s take on the traditional Presidential suite) is a decked-out party palace with sweeping views of sparkling Lake Washington. 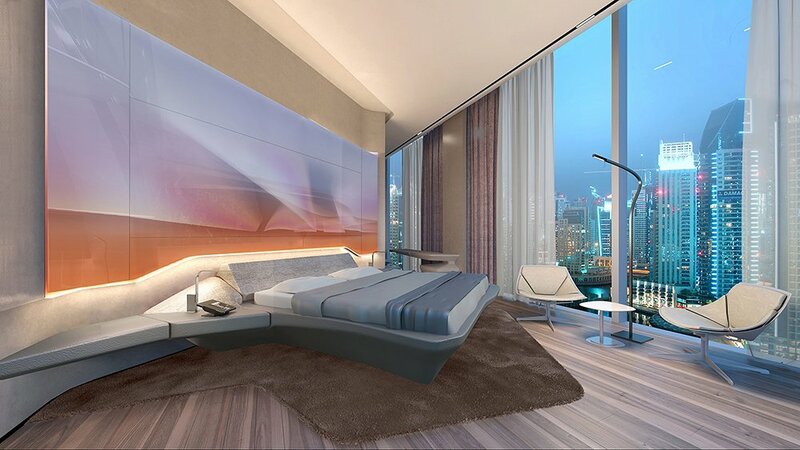 Perched high on the thirteenth floor, the double door entry opens to a vibrant suite featuring two king beds (with one hanging from the ceiling) a state of the art surround sound audio system (vinyl included), an in-room pool and poker table and retractable flat screen TV. 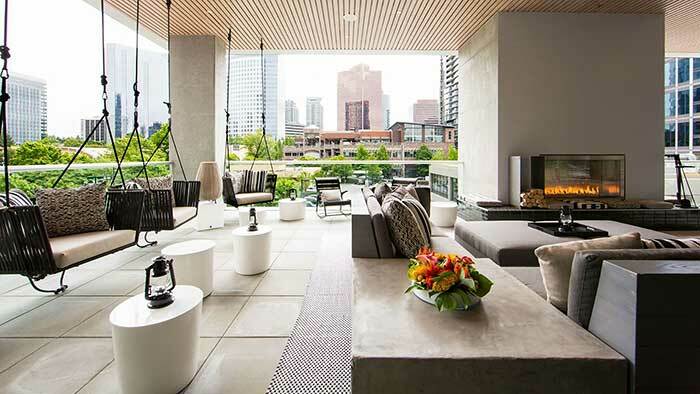 Modern hanging porch swings line the border of the suite, offering guests a chance to feel as if they’re floating over Bellevue. 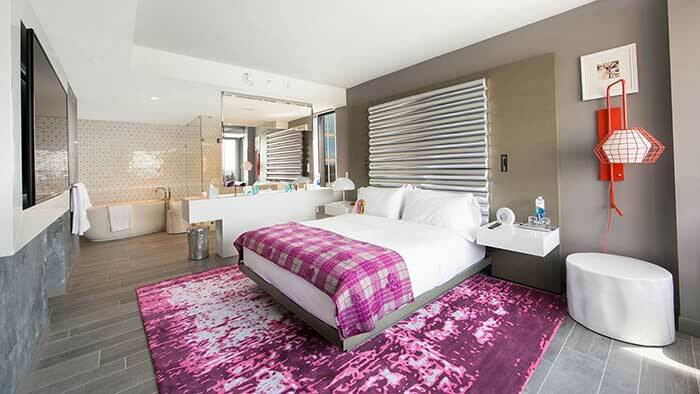 W Hotels in Bellevue, WA: Stay In, Eat Out. Guests at W Bellevue don’t have to wander far to find incredible cuisine at The Lakehouse, showcasing a Northwest farmhouse concept, and Civility & Unrest, a speakeasy-inspired cocktail lounge, both from James Beard Award-winning chef, Jason Wilson. Inspired by Bellevue’s sense of place and evolution, Chef Wilson showcases vibrant, farm-inspired craft cooking, spotlighting his ever-evolving grower and farmer relationships. The space is designed as a modern, multifaceted interpretation of an entertainer’s lake home. Familiar, yet elegant and sophisticated in design, the welcoming space features layers of interest and a thoughtful division of rooms, including the garden room, butler’s pantry, “wild modern” private dining room, “wild primitive” dining room and chef’s counter seating. A counter height bar, porcelain antler sconces, a column of living greenery, trestles and interspersed charred wood, inspired by Bellevue’s past Japanese farmers who preserved wood in the authentic shou sugi ban method, are seen throughout. The restaurant is open for breakfast, lunch and dinner, daily. Chef Wilson also oversees in-room dining throughout the hotel. Hidden within Gaia’s showpiece is a discreet entrance to Civility & Unrest, a modern speakeasy-inspired lounge offering a craft cocktail insider experience by Chef Wilson. Steeped in discovery, the whiskey bar and cocktail lounge offers a daring exploration into cocktail culture with rare scotch, vintage whiskey, flowing champagne and craft cocktails, surrounded by beautiful curves and plush seating. The 4,400-square-foot Great Room shows off vibrant décor and stylish finishes underneath deconstructed docks that float just below the ceiling. The carpet contains layers of tribal tattoos with archetypal house shapes referencing the native cultures of the Pacific Northwest overlaid on a stylized lake background, making the Great Room the perfect location for any unforgettable event. Both Strategy rooms and six Studios continue the theme of lakeside living with window-like mirrors and dock light sconces which provide an ideal space to gather for work or play.